We’ve now returned home after our San Francisco trip. Sadly we came home to the news that our eldest cat, Clyde, had passed away during the night. He was fourteen and had been with us since he was three years old. Clyde was our first rescue cat, from the Cats Protection League. 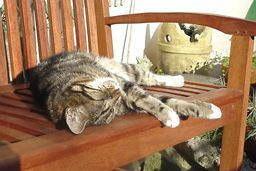 One of our good friends, Diana, was looking after the cats for us while we were away and told us the news. She was one of "Clyde’s women" – he’d been visiting her for years and despite his infirmity had been able to climb the back garden wall to spend his last week in her company. Clyde had not been himself for several months and had developed both hearing and sight problems but it’s still very difficult to accept that he’s now left us. I can’t quite express just how much he’s missed. I still can’t believe he’s gone. Knitting stuff to return when I’m feeling a bit better. I’m still surprised at how quickly the days here have flown by. I wish I could have a portal at home in Cardiff that led to San Francisco. So this is our last night here until we come back next year. We did some touristy stuff today as I’d never been to Ghirardelli Square before. It was very touristy so we went to The Cannery which was better and had some impressive concrete animals including cats. We did take pictures but don’t have the software to make my iBook talk to the camera so those will added later. Then this evening we went to Oriental Pearl in China Town and had a great, and very inexpensive, meal. Now I don’t know why but certain knit bloggers are in the habit of trying to marry Andy and I off. Rest assured that we are not married and are happily living in sin! We fly back tomorrow morning, but before that I have to squish some yarn into my case! 🙂 Oh and of course there’s the difficult decision of which knitting project to take on the plane. On Saturday it seemed as though I had loads of time in SF now it’s our penultimate night here. But it’s been a good few days and I’ve even managed to fit in a couple of visits with bloggers! Sunday I went to Art Fibers and bought eight balls of Sherlock for a cardi and two balls of Fauve for a scarf. Picture to be added. I’m not sure what type of pattern to use for it just yet. Maybe the diagonal scarf? Well we’re slowly getting used to the time difference. I think I’m pretty much on PST now but Andy still seems to be waking up in the middle of the night. It’s a lot of travelling and it does take a while to catch up to it. Saturday was our first full-day in the city so we went to another city, Berkeley. We both like to see what’s in Amoeba Music – Andy for the cds, me for the dvds and there are other places there like Gilt where I stock up on soaps. We didn’t make it over to Stash Yarn sadly but we did get to see Broken Flowers. It’s been out in the states for a while but had only just opened on Friday in the UK, so I was a bit gutted at the prospect of having to wait a week before seeing it. It’s a good film, lots of stuff happening beneath the surface. So we saw an early afternoon showing of that and then had a bento box at a noodle bar across from the cinema and went back to the hotel. The first day is always pretty tiring. The hardest part of packing for a trip, for me anyway, is deciding what type of knitting project to bring. For this one I brought 40g of Fyberspates Silk Boucle and the Fyberspates scarf pattern. I’ve made this scarf once before but I think I was wrapping the yarn the wrong way around the needle because my scarf was a bit different from Jeni’s. It wasn’t as open as it should have been. The SF trip scarf is knitted on Denise needles rather than my usual Addis and I’m wrapping the yarn properly now. This would be the time to post a picture of course because the scarf is quite pretty. But I haven’t got one to post – yet! Check back because I’ll be updating this entry with a picture soon. Not long now until we fly to San Francisco! 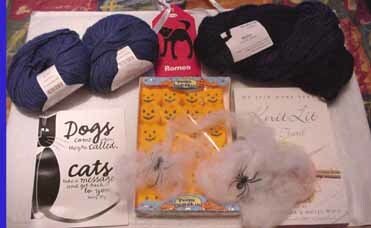 I promised a pic of my fab October parcel from my Better Pal and here it is! Two balls of butter soft Knit Picks Ambrosia in Nightshade, one skein of kettle dyed yarn in indigo, a copy of Knit Lit the Third, a cat bookmark, pumpkin Peeps (there were also some chocolate filled Peeps but they seem to have disappeared…:-)) and cobwebbing! In fact I was momentarily alarmed when I opened the parcel to find a spider! They’re all wonderful! thank you Better Pal! Well Ally Pally was great but very tiring! But I did manage to fit in some yarn purchases while I was there! :-) More on those later. Meanwhile, I’m a member of Better Pal. It’s for those who felt that Secret Pal was just getting a bit too big. This is a smaller group. It runs until November and I’m a bit behind in posting about my presents! My September parcel from my lovely BP! Mountain Ocean Skin Trip – a gorgeous coconut body lotion that is now half full because I’ve been using it so much! 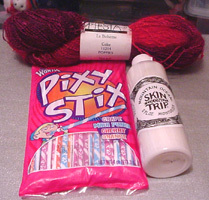 – some sherbert sweets and some wonderful yarn! Fiesta la Boheme in Poppy. It’s a strand of mohair and a strand of rayon, both hand dyed. I think it will make a wonderful wrap. I’ll try and post pics of my fab October parcel tomorrow. We fly to San Francisco on Friday so I have a lot of packing to do! I haven’t blogged for a while because I’ve still been having bouts of illness and writing about feeling ill must be about as boring as the being ill itself! So that’s why I haven’t blogged recently. I have still been blogging on KnitCast though and posting interviews over there. At the moment I’m in London for The Knitting and Stitching Show. I was too exhausted for it today though. Jeni and I arrived in London very late last night and then had to get up early this morning. I wasn’t able to get much sleep because I was worried about waking up on time in the morning! So today has been a bit of a haze. Inbetween the haze I interviewed Andrew Salmon managing director of the organisers of the show, Creative Exhibitions, and met up with my friend Michele for lunch. I also met Kristine and her friend Debbie, Kerrie and her dad, and Yvonne one of the Rowanettes. It’s still strange to meet people with whom you’ve emailed and sometimes even actually spoken to before, yet never met in person. On the knitting froont, in blog absence I’ve finished one top-down-raglan cardi, nearly finished another and have started yet another. The newly started one is from Art Fibers Kyoto.